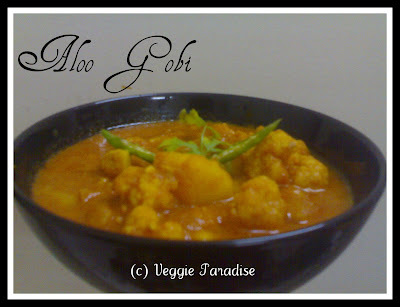 Aloo Gobi in Tomato Gravy. 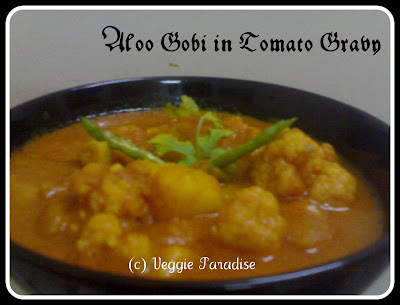 This is a combination of gobi and Aloo in tomato gravy. A different tasty side dish for Chapathi's. 1 cup of Gobi florets. Wash and blanch the tomatoes, puree them and keep it aside. Heat water , along with turmeric powder and the cauliflower florets,once the florets gets half-cooked,drain the water and keep them aside. Peel the potatoes, dice them. Pressure cook them in 2 whistles. Heat oil in a pan, add the ginger garlic- paste and saute them well. Add the ginger garlic paste and saute them until the raw smell extracts from it,now add the cashew powder. Add the tomato puree, salt, garam masala powder and chilli powder. Cook until the raw smell extracts and the gravy gets slightly thick. Now add the cauliflower and potatoes and mix them gently. Cover and cook for 5 min. in low flame. I just love this combination.. very colorful and delicious.. Thanx for sharing.. nice click!! quick and delicious combo Aruna. Fantastic one for roti..looks so good . Gravy looks awesome, prefect side dish for rotis for the sure..
Aloo gobi looks delicious and tasty..my daughter keep asking me to make it..now I have too.. Very well cooked gravy by the look of it seems to fill the entire room with beautiful aroma. Will perfectly gel with either roti. Aloo gobi looks so perfect, nice colour, rich gravy and so mouth watering.Beautiful click too.Following you at facebook. Excellent side dish and loved the color of aloo gobi. first time coming by here.. great to come by to learn more new dishes..
Nice Combo!!! Perfect choice for Rotis!! As fotos dos pratos são belíssimas! I like this combination. First time here. You have nice space here. Looks absolutely delicious, nice combo. Oh I had totally forgotten abt this lovely delight. I am an ardent fan of potato and cauliflower combo...Luv yur recipe.